Hi, I'm Tony Markowski. I've been in the repair business for more years than I care to admit. In that time I've learned that choosing the right repair shop can be confusing. In fact, people have so many misconceptions about car and truck repair shops that I decided to offer this information so when you need to select a repair company, you can make an informed decision. I'm sure you will find the following information helpful but if it does not fully answer your questions please call me at (734) 558-3551. You car manufacturer specifies regular maintenance schedules just to get you back into their shop to make money off of you. Manufacturers are making cars and trucks better than ever. But, they do require preventative maintenance. For instance, according to the Car Care Council "regular oil changes are one of the most important preventative maintenance measures you can take." Other examples include maintaining your brakes for safety reasons or having the timing belts replaced before they wear out and break and cause even more damage. With proper maintenance you can expect your car to last well over 100,000 miles. A shop can give you an accurate price quote over the phone without ever seeing your car. That simply is not true. You can waste your time calling 20 different shops and get 20 different answers. And, there is a good chance all of them could be wrong. Unless the shop has had a chance to examine or test-drive the car in person, there is no way to accurately diagnose your problem and give you an accurate quote. Beware of any shop that is willing to give you a quote over the phone without seeing the car or at least qualifying the quote. For example, if you say you want a quote on fixing your exhaust, the price could be anywhere from $10 to $1,000. Be cautious of any shop that diagnoses the problem or gives you a low quote. Most likely you will find they misdiagnosed the problem and you'll end up frustrated and unhappy. The fact is, any repair shop that doesn't look for potential problems is actually doing you a great disservice. Quality repair shops will perform an inspection on every car that comes into their shop to uncover those inexpensive repairs that may be needed now, before they turn into major expensive repairs. Something as simple as discovering and then changing a worn belt may save you the danger (and maybe embarrassment) of breaking down on a busy highway and an expensive towing bill. No. In fact, there can be huge differences between repair shops. The new car technology requires constant training to keep up with all of the changes. It also requires the shop to have the latest diagnostic equipment available. The repair shop with the best trained technicians and with good up to date equipment will obviously be better equipped to diagnose your car or truck's problem and therefore be most likely to do the best repair for you. Here are a few suggestions to help you choose a good, reputable repair shop. First, ask around. Has anyone you know had a good experience with a particular repair shop? And finally, make sure they guarantee their work. Now here are the six questions that you must ask any repair shop before you visit them. Do they have the most up to date training and diagnostic equipment for your particular car or truck? If they give you an estimate over the phone, will they absolutely guarantee their price regardless of their diagnoses of the problem? Do they perform a full inspection for free to uncover any other potential problems? Are all their technicians certified? Will they provide a ride to and from work the day your car or truck is being serviced? Do they guarantee their work and what is their warranty policy? By following my suggestions and asking the repair shop these questions, you'll gain all the information that you need to make an informed decision. If you are looking for the cheapest repair shop possible, many companies in the phone book can help you. But if you're looking for an honest, ethical, professional repair company to protect your valuable investment - then I'll invite you to call me at (734) 558-3551. I'll be happy to answer your questions and provide you with a free written estimate - without any obligations at all. Here's one last point: If you can't feel comfortable about the shop you most likely will never feel like the work done on your car or truck was performed to your standards. I hope you found this consumer help message helpful. If you have questions or comments, or would like to set up an appointment to visit one of my shops, feel free to give me a call. Again my number is (734) 558-3551. 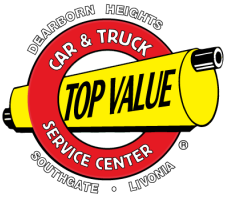 On behalf of Top Value, I thank you for your time and consideration.